Living in the High Meadows community brings many benefits, from membership privileges at a beautiful country club and excellent golf course to close proximity to great beauty in the Blue Ridge Parkway and the New River. Yet another benefit is the beauty of the landscape and wildlife that makes up the High Meadows community itself. Just take a walk through the neighborhood roads and you’re sure to see plenty of squirrels, a groundhog or two, and maybe even some deer. And of course, there are birds everywhere, chirping in the trees, scrounging for insects and seeds among the leaf piles, and flying overhead in the clear blue sky. It’s easy to take birds for granted, since there always seem to be so many and they’re such small, inoffensive creatures. But our birds are actually facing hardships up and down the East Coast, due to growing populations and continued development that encroaches on their natural habitat, as well as climate change that is threatening their ranges of wintering, breeding, nesting, and migrating. Currently there are 13 birds listed on the North Carolina Audubon Society’s web page as climate threatened: golden winged, cerulean, and black-throated blue warblers; American black duck; piping plover; brown pelican; tundra swan; American oyster catcher; osprey; brown-headed nuthatch; ovenbird; wood thrush; and barn owl. Luckily, there are ways we can help all of these creatures as they look for places to nest and food to eat. One way is to try to use native plants in your landscape. The seeds and berries produced by native species are familiar food sources to the birds in our area. In addition, these plants attract butterflies and other pollinators as well, which means plenty of insects and caterpillars for birds to feed on. According to the Audubon Society, 96 percent of all terrestrial birds in North America feed insects to their young even if they are seed eaters as adult, in order to give them the best chance of surviving as hatchlings. 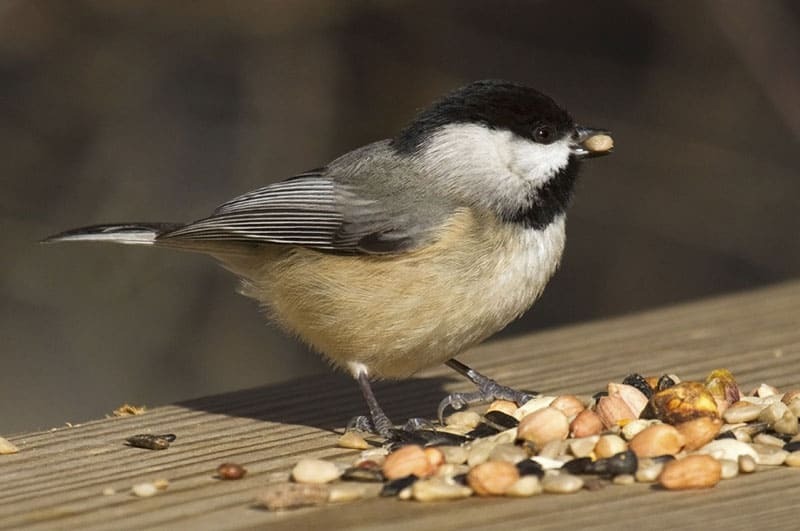 Take, for example, the Carolina Chickadee, where a clutch can eat over 9,000 caterpillars in the first 16 days after hatching. January and February are often the months where we’re pouring through seed catalogs and dreaming about all the beautiful flowers we’ll have in our gardens come spring. This year as you plan your spring and summer landscapes, try to include a few native species as well. The color and beauty of our native plants will be just as beautiful to you as it is helpful to the birds. Here are a few plants to try, and the birds they attract. For more information about our birds and how to help them, visit the North Carolina Audubon Society.